Will AI robot writers take over from human copywriters? With so many people turning to writing blogs, writing articles and writing copy yet lacking sufficient industry expertise (see my blog on how to find the right freelance copywriter), let’s address the subject of AI robots. How much cheaper is it for clients to use an automated copywriter or an AI robot writer instead? How likely am I to be replaced by an AI robot? Could Caroline Gibson ever be substituted with Caroline Gibbot? Need a press release? PingGo uses smart PR templates to generate press releases. Just choose one you fancy, answer some questions and up will pop your dazzling press release like a piece of hot toast. Need some some clever marketing messages destined to successfully engage an audience? Persado is a cognitive content platform that ‘arms organizations and individuals with smart content that maximizes the efficacy of communication with any audience at scale, while delivering unique insight into the specific triggers that drive action.’ Enough said. Need to turn data into real time narrative? Automated Insights uses a type of artificial intelligence to create content: NLG (natural-language generation) to generate narrative ‘on a massive scale that sounds like a person crafted each one’. Fab. AI chatbots: how real is unreal? Automation is one of the biggest trends right now – and you can read more in my blog about voice search and whether VEO will become as important as SEO. But yet it can go horribly wrong. Look what happened when Microsoft launched an AI-powered chatbot called Tay.ai on Twitter to engage with a younger audience. The AI robot started posting abusive and rude tweets and it was shut done within just 16 hours. Yes, Cleverbot can hold a human-like conversation based on searching its database for a relevant and worthy response. And as for talented Eviebot, whose AI is shared with Cleverbot, she can speak to you in several different languages and is described as ‘the most popular artificial personality on YouTube’. I’m as green as apples. What a gal. 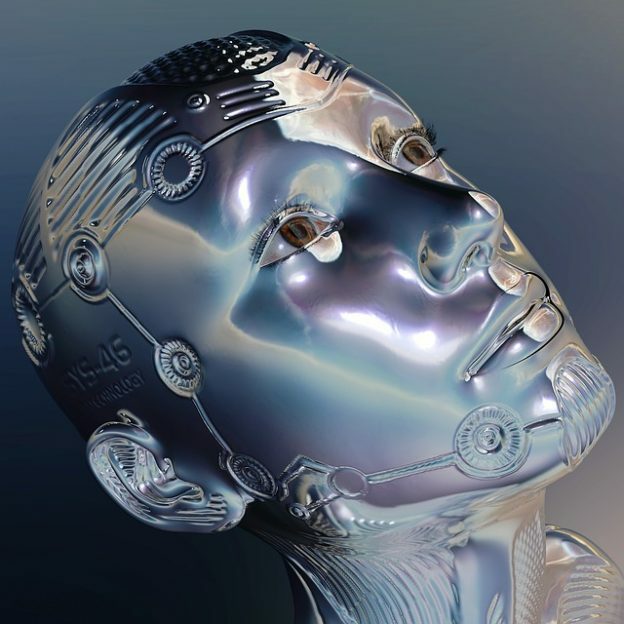 Artificial intelligence or human intelligence? I’ve already covered the importance of using a copywriter with strategic expertise in Which Would You Prefer: A Copywriter Who Writes? Or A Copywriter Who Thinks? Meanwhile, I’ll leave you with this online tool which is equivalent to a very lazy copywriter: Shopify . It invites you to enter a term to describe your business and it will generate up to 1,000 relevant slogans for free. Wow. (Wondering what’s the difference between a slogan and strapline? Let me reveal all). 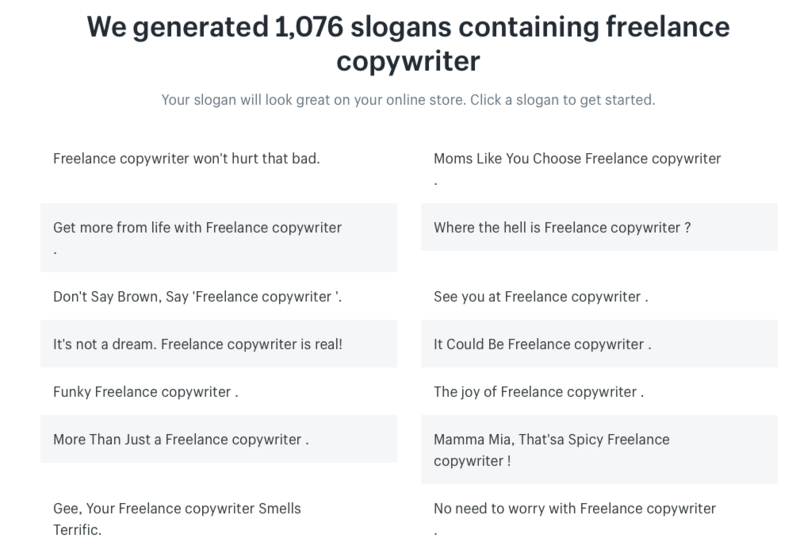 I entered the term’ freelance copywriter’ and here are just a few of the 1,076 pearls suggested. So if you’re wondering where on earth I am, how terrific I smell or how spicy my copy might be, there’s really no need to worry as you’ll be dealing with a walking, talking creative and strategically-thinking human. It’s not a dream. This freelance copywriter is real. Written by Caroline Gibson, freelance copywriter who can think, write, interrogate and make a better cup of tea than any robot. This entry was posted in Life as a freelancer, Marketing & branding advice, Web content tips and tagged AI copywriting, AI robot writer, AI writing, Artificial intelligence, Chat bots, Tay.ai on September 5, 2018 by Caroline Gibson.